If you’re planning to don your skis or go on a few sled runs this winter, you should think about which watches are appropriate to wear in the snow. After all, not every timepiece can withstand the demands of the slopes. Make sure you give your winter watch selection some thought to ensure the timepiece survives your mountain vacation unscathed. Winter sports go hand-in-hand with snow and ice, i.e., frozen water. It is therefore essential that any watch you take on your snow holiday is protected against water. The rule of thumb is that any watch worn in the snow should be water-resistant to at least 330 feet (100 m, 10 bar). Timepieces that are only protected against splashes, i.e., water-resistant to 30 m (100 feet) or 50 m (160 feet), are not sufficient! It can mean serious trouble if you slip in the snow or get hit with an unexpected snowball and your watch isn’t made for it. Winter sports watches also have to be shock resistant. Whether you’re racing along like Martin Fourcarde on your cross-country skis, hitting the slopes like Lindsey Vonn, or practicing a double backflip on the half-pipe like Shaun White, your watch has to be able to handle some pressure. There’s nothing worse than realizing your watch didn’t hold up after a day on the slopes and is now malfunctioning. You need a watch with stable oscillation and escapement systems to survive an active winter vacation with peace of mind. Quartz watches have an advantage in this regard as they are regulated by a quartz crystal. Watches with an analog display have a small stepping motor as well, meaning there are few mechanical components that can be impacted by shocks. Mechanical watches with balance springs, rotors, escapement wheels, and escapements are much more fragile. If you do opt to take a mechanical watch with you, make sure you select one with a good anti-shock system. Freezing temperatures are yet another demand placed on watches in the mountains. Any timepiece that you take skiing needs to be reliable in the coldest, most bone-chilling weather. Likewise, timepieces must be able to handle rapid fluctuations in temperatures without major impacts to their performance. The weakest link for most mechanical watches when it comes to temperature is the balance spring. These are typically made of metal alloys, which react to changes in temperature by expanding or shrinking. This can prevent delicate balance springs from oscillating properly, which leads to deviations from the accurate time. In the worst case scenario, the balance spring will stop completely; of course, conditions have to be extreme for that to happen. Most modern balance systems have become more tolerant to fluctuations in temperatures thanks to many years of research. The situation is similar with quartz watches. In the past, low temperatures negatively impacted quartz watch batteries, but technology has improved dramatically over the last few years. So, which watches meet all these demands? Thankfully, there are quite a few to choose from! We’ve selected some examples that will certainly make a statement during your next snowy adventure. We’ll start with the quartz-powered outdoor watches from Casio’s Pro Trek collection. Similar to sister models from the famous G-Shock line, these watches are extra durable thanks to their resin cases. They are water-resistant to 330 feet (100 m, 10 bar), are solar-powered, and can easily withstand temperatures down to 14°F (-10°C). Casio has also equipped the timepieces in this collection with helpful additional features such as a digital compass, an altimeter, and a thermometer. The LCD display additionally indicates the sunrise and sunset times. A GMT, stopwatch, and numerous alarms round out the overall package – plus, these watches are affordable. For a markedly more classic look, check out the Longines Conquest 1/100th Alpine Skiing. This traditional Swiss watch manufacturer has been the official timekeeper of the Alpine Ski World Cup for many years and released this timepiece in celebration of the competition’s 50th anniversary. The 41-mm stainless steel case features a screw-down case back, scratch-resistant sapphire glass, and a screw-down crown, making the watch durable and water-resistant to 985 feet (300 m, 30 bar). The timepiece is quartz-powered, which allows you to time to 1/100th of a second. The design is stylish and sporty, making it the perfect companion to an après-ski party. German manufacturer Sinn is well known for their mission timer (Einsatzzeitmesser – EZM) watches. These watches were developed with flight rescue teams and marine divers in mind. One example from this line is the Sinn EZM 12. This watch is water-resistant to 655 feet (200 m, 20 bar) and features special dehumidifying technology that prevents the watch glass from fogging up and causing damage to the movement. The watch is also shock-resistant and can withstand temperatures between -49°F (-45°C) and 176°F (80°C). The Rolex Explorer and its younger sibling, the Explorer II have a long history when it comes to ice and snow. Sir Edmund Hillary and the Sherpa Tenzing Norgay wore early prototypes of the legendary Explorer during the first ascent of Mount Everest. Both models have been beloved by mountaineers and polar explorers ever since. Not only are these watches extremely readable, they also boast robust construction. The stainless steel Oyster case and double-sealed Twinlock crown protect the movement from water up to 330 feet (100 m, 10 bar). The timepiece can withstand shocks and shakes thanks to Rolex’s Paraflex anti-shock system. Moreover, the Parachrom hairspring leaves the balance spring unaffected by fluctuations in temperature. Whether you select the streamlined Explorer or the Explorer II with an additional timezone and date display, you are guaranteed a true Rolex classic that will make a statement on the slopes. Swiss manufacturer Hublot is closely linked with winter sports – they even run their own ski lift, the Hublot Express at the popular skiing destination Zermatt. Suitable winter timepieces can be found in Hublot’s Big Bang collection. The watches stand out with extravagant designs and a unique combination of materials. 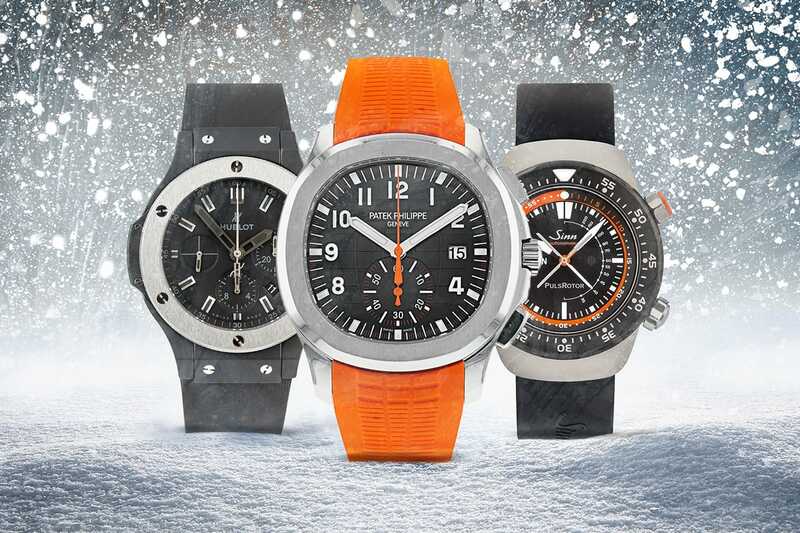 They are not only precise timepieces, but also fashion statements both on and off the slopes. There’s no need to avoid taking a mechanical chronograph on your skiing vacation. There are numerous suitable models on offer. The Speedmaster Mark II from Omega is one such candidate. It is protected against shocks thanks to its Co-Axial caliber, is water-resistant to 330 feet (100 m, 10 bar), and can time to 1/4th of a second. The Swiss luxury manufacturer knows a thing or two about winter sports: It has been the official timekeeper of the Winter Olympic Games and the Bobsleigh World Cup for many years. The German family-run manufacturer Mühle-Glashütte has crafted a hardy chronograph that meets the toughest requirements with their S.A.R. Flieger-Chronograph. The watch was developed and tested together with the German marine flight rescue team. A casual trip to the snow is nothing for this timepiece. The crown and push-pieces are located on the left side of the case to enable maximal freedom of movement. The start/stop push-piece was made extra large and can easily be operated while wearing gloves. Does it get any more luxurious than this? The Patek Philippe Aquanaut Chronograph is the epitome of class. This sporty sibling to the beloved Nautilus is the perfect companion to any ski attire. It is water-resistant to 390 feet (120 m, 12 bar) and features a flyback chronograph function. While this watch is not suitable for the wildest adventurers amongst us, it is certainly the perfect choice for standing out in ski huts and lodges.